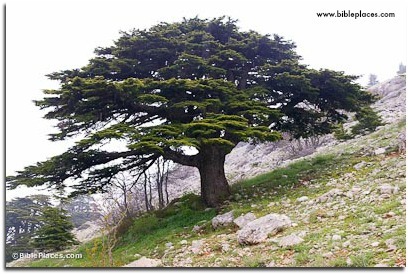 The cedars of Lebanon were the most famous trees in all of antiquity. They defined the economy of ancient Lebanon. Pharaohs from ancient Egypt, kings from Assyria, Babylon and far-flung reaches of the ancient world all clamored for the great timber of these cedars. They were mentioned extensively in connection with the construction of Solomon's First Temple in Jerusalem. Lebanon geography divided the country into vastly different regions. When one looks at a map of Lebanon, one immediately notices it is a land between mountains and the sea.These factors would mesh to create an international economy which reached to the far flung regions of the known world. Click a link to view that map. It was also a country sandwiched in-between Syria and Palestine, both of which profited greatly as well from the cedars of Lebanon. Lebanon was in a unique position to spread its wealth both east along the trade routes, and west along the Mediterranean Sea. Perhaps no other country was as defined by its geography as Lebanon. 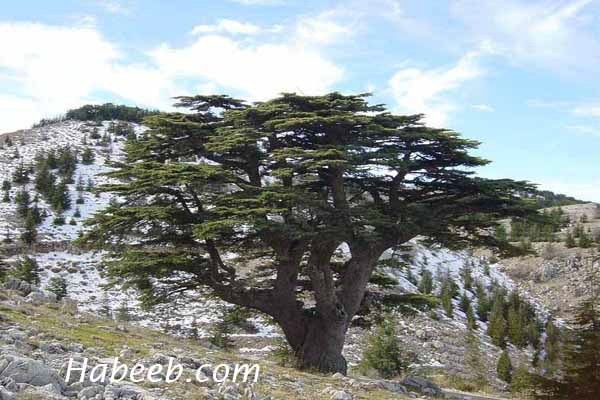 The cedars of Lebanon were cut from the dense forests of the mountains. Down below was fertile land in the Beqa Valley, and great natural harbors along the coast. The history of Lebanon, thus, was a diverse and rich history due in large part because of the ease of travel and trade both along the land caravan routes, and the sea-trade routes. The cedars of Lebanon were cut from the snow capped peaks, transported west to the coastal port cities, loaded onto Phoenician ships and shipped throughout the world. In some instances, such as the one between Hiram and Solomon, the cedars were tied together in rafts and transported down the coast to predetermined ports. The snow capped mountain peaks have been offered as the reasoning behind the name "Lebanon". It's proximity to the sea allowed the development of great port cities, formed from natural harbors. The Phoenician culture became the expert sailors of antiquity. They dominated maritime trade and activity. Tyre, Sidon, and Byblos were just a few of the great Phoenician ports. Phoenician culture dominated Lebanon, and impacted ancient Israel mightily as well. The shoreline was rocky in the north, and sandy in the south. As one ventures eastward from the coast the map of Lebanon changes drastically. The Lebanese Mountains quickly come into view, towering above the horizon. Lebanon geography is divided by this range, and the Anti-Lebanese Mountains further east. This was the supply of their prized cedars of Lebanon. The Western Mountain Range of Lebanon, also known as Mount Lebanon, are the highest and most rugged of the two ranges. It was from this range in the particular the famed timber was harvested. The Phoenicians used these trees to build their extensive navy, as well as trade and build their mighty civilization. Interestingly, though, the ancients practiced sound environmental strategies by continually planting trees, thus replenishing the supply. LEBANON'S MOUNTAINS SLICE THROUGH THE COUNTRY, DIVIDING IT IN HALF. THE BEQA VALLEY RESTS BETWEEN THE TWO RANGES. MOUNT HERMAN TOWERS ABOVE THE LANDSCAPE IN THE SOUTHERN PARTS OF THE COUNTRY. THE MOUNTAINS IN THE EAST GIVE WAY TO THE COASTLANDS OF THE WEST. "The bramble said to the trees, 'If in truth you are anointing me as king over you, come and take refuge in my shade; but if not, may fire come out from the bramble and consume the cedars of Lebanon." I Kings 5:6 makes mention of cutting "cedars from Lebanon" for the Temple Solomon was to build. This passage is a prime example of how ancient Lebanon used these cedars to establish international relationships through trade. King Hiram of Tyre had made an alliance with King David, as I Kings 5:1 states "Hiram had always been a friend of David". In v. 6 Solomon asks Hiram to honor the relationship and send him cedars from Lebanon to build the Temple and his palace. Hiram's response also corroborates what history has proven - the mode of transporting the cedars of Lebanon. In vs. 8-9 Hiram answers King Solomon. "...I will do what you desire concerning the cedar and cypress timber. My servants will bring them down from Lebanon to the sea; and I will make them into rafts to go by sea to the place where you direct me, and I will have them broken up there, and you shall carry them away." Hiram tied the timber together and floated these rafts to Solomon's port, where Israelites and other laborers carried them to Jerusalem and constructed the Temple. What an awesome illustration of ancient trade and international ties. 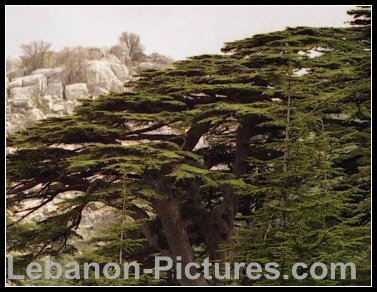 Great strength was associated with the cedars of Lebanon, as illustrated by a passage from Psalms 29:5. "The voice of the Lord breaks the cedars; yes, the Lord breaks in pieces the cedars of Lebanon." Even the prophets Isaiah (Is. 2:13; 14:8), Ezekiel (Ez. 27:5; 31:3) and Hosea (Hos. 14:5-6) spoke of the cedars of Lebanon in their prophecies. Perhaps the most fascinating verse concerning the cedars of Lebanon is found in Psalms 104:16. "The trees of the Lord drink their fill, the cedars of Lebanon which He planted,"
It only makes sense that trees planted by the Lord Himself would be so sought after by the nations of old. In fact, the so-called "Jesus Boat", one of archaeology's greatest finds in Galilee, is a first century AD boat like the one Jesus and His disciples would've used and was discovered in the Sea of Galilee. It was composed of reused timbers, some of which were the famous cedars of Lebanon. The Egyptians desired these cedars for use on their sacred boats, used to carry images of gods up and down the Nile. Byblos was the port of entry for the cedars. Byblos was an ancient city, dating back to before 9,000 B.C.E. It was an extremely important port city in antiquity. Excavations at Byblos have revealed a heavy Egyptian presence in the 2nd millennium B.C. Cultures and civilizations from all parts of the world would have docked at Byblos. 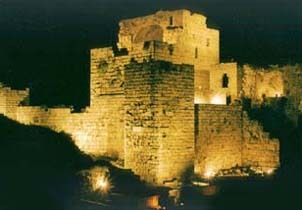 Byblos is mentioned in at least two ancient Egyptian texts. The Palermo Stone speaks of cedar from Lebanon being imported to Egypt in the reign of King Sneferu, the 4th dynasty Pharaoh (ca. 2613-2589 BC). The ancient Egyptians used it for the construction of boats, among other things. "I cry out to the Lebanon, the heavens open up, and the logs are here lying on the shore of the sea!...Give me the ropes you have brought me to lash down the cedar logs..."
They also used the resin in their mummification process. For this reason they called it the "life of death". Cedars of Lebanon sawdust was also discovered in some of the tombs of the Pharaohs. The earliest references of the cedars of Lebanon come from Mesopotamia. One reference to the cedars of Lebanon dates from Sargon of Akaad, ca. 2334-2279 BC. The famed cedars are discussed frequently in the great Epic of Gilgamesh, the earliest copies of which date to the 7th century BC. Some later traditions have dated its composition to a priest from Uruk known as Sinleqqiunninni, who lived possibly in the 13th century BC. On Gilgamesh's Journey To The Cedar Forest we are told, "On the third day they drew near to the Lebanon." This obviously leaves little doubt as to the cedars of Lebanon being the Cedar Forest of the Epic. Later in their journey they stood at the Cedar Forest's edge. Their they "saw the Cedar Mountain, the Dwelling of the Gods...". Gilgamesh and Enkidu captured Humbaba, Guardian of the Cedar Forest. As they fought with Humbaba, "they whirled around in circles. Mt Herman and Lebanon split...". At the end of this partiulcar episode, Gilgamesh and Enkidu, like King Hiram would later for King Solomon, tied together a raft from the cedars of Lebanon and "steered it while Gilgamesh held the head of Humbaba." "I vow ye trees of Lebanon..."
In a document from Ashurnasirpal II (883-859) entitled Expedition to the Lebanon, the king of Assyria brags how he; "ascended the mountains of the Amanus and cut down the logs of cedars.."
A few lines later King Ashurnasirpal II reveals how "the cedar beams from the Amanus mountain I destined for the temple of Esarra for the construction of a sanctuary as a building for festivals serving the temples of Sin and Shamash, the light giving gods." "as building material for my palace: big logs, long beams and thin boards from cedar and pine trees, products of the Sirara and Lebanon mountains, which had grown for a long time into tall and strong timber.."
The cedars of Lebanon were indeed prized material, used for construction by kings and pharaohs the world-over. They were often tied together and shipped down the coast in the form of rafts, surely a spectacle to behold. The logs were loaded on ships and sailed great distances, to empires far away and peoples in the remotest parts of the world. The western border of Lebanon is the Mediterranean Sea. Lebanon's Coastal Plain is a thin strip of land sandwiched between the Great Sea and the mountains. This fertile region produces an abundance of fruits and vegetables. In the north, near Tripoli, the Coastal Plain is at its widest, just over 4 miles in width. These natural ports provided entry and exit points for trade. The cedars of Lebanon would leave their native land from these ports and sail around the world. The highest peak in Lebanon reaches 10,115 feet. Local residents found safety in the high altitudes from marauding invaders. On the highest slopes, there remains today the last remaining groves of the prized cedars of Lebanon. THE MAP OF LEBANON INCLUDES SNOW CAPPED PEAKS, DESERT IN THE SOUTHEAST & LUSH, FERTILE GREEN COAST LANDS. As the map of Lebanon descends down the eastern slopes of Mount Lebanon, the Beqa Valley summons from below. 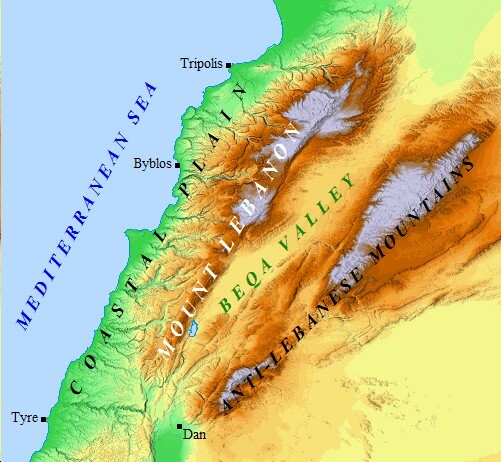 The Beqa Valley is located 19 miles east of Beirut, and stretches a total of 75 miles from north to south. The Beqa rises just over 3,000 feet in elevation, and is very well watered by two rivers. 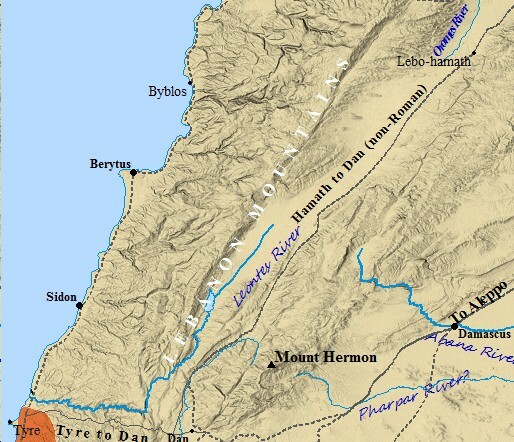 The Orontes River flows northward into Syria, while the Litani River flows southward, emptying into the sea just north of Tyre. This valley was rich in resources, and throughout the history of Palestine trade flowed between the regions. Lebanon maintained a steady presence throughout the history of Palestine. King David invaded this region, taking over the rich copper deposits located in Aram-Zobah, and the ivory found in Hamath, located on the Orontes. Lebanon geography then rises up the western slopes of the Anit-Lebanese mountains, the second of the two ranges. 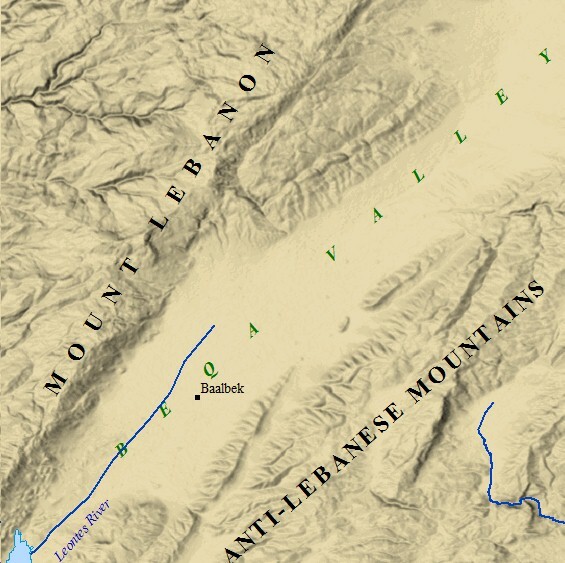 The Eastern Mountain Range of Lebanon, or, the Anit-Lebanese Mountains, are nearly identical in size and ruggedness to their western counterpart. THE BEQA VALLEY SITS IN THE MIDDLE OF LEBANON'S TWO MASSIVE MOUNTAIN RANGES. IN THE SOUTH IS THE TOWERING MT. HERMAN. INTERESTINGLY, ENOCH REVEALED THE WATCHERS WHO DESCENDED FROM HEAVEN FIRST LANDED ON MT HERMAN. NEARBY TO THE NORTH IS THE ANCIENT & MYSTERIOUS SITE OF BAALBEK, WITH ITS MONOLITHIC STONES AND ANCIENT TEMPLES. 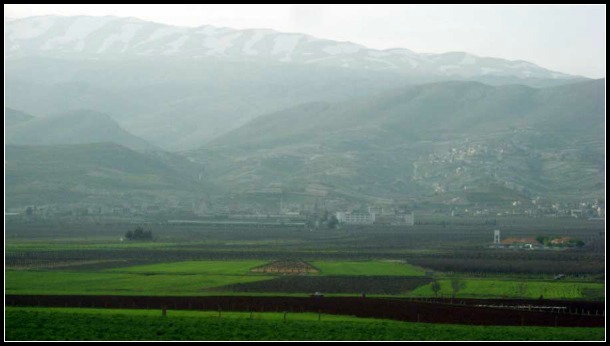 However, these mountains are not as fertile, or productive, as Mount Lebanon. The Anti-Lebanese possess a maximum height of 9,232 feet. The name stems from the Greek word translated as, "opposite". The famous Mt. Herman was the largest peak, and is located at the southern end of the range. It was at Mt. 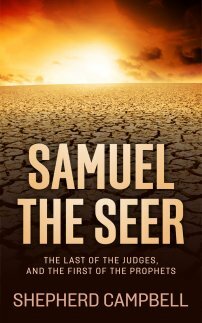 Herman the prophet Enoch claimed the Watchers descended from the heavens. Mount Herman has also been suggested as a site for the Transfiguration of Jesus Christ. Jesus took three of His disciples with Him to a mountain top, and there Moses and Elijah appeared with Jesus. Baal-bek was located in the Beqa, and once possessed splendid Roman temples. Massive stone foundations in Baal-bek have baffled archaeologists since their discovery. These foundations possess over 5 million square feet of stone, more than the Great Pyramid at Giza. This area was also the site of many of the events in the book of Enoch. Inhabiting the western coast of Lebanon were the Phoenicians. Stuck between the sea and the mountains, Phoenicia had little choice but to look to the sea. They also impacted the history of Palestine through their colonization of the Mediterranean and trade and commerce from Greece, Rome, Africa, and other countries throughout the Great Sea. The mountains not only inhibited travel, but also limited the amount of land available for crops. Natural ports and harbors lined the coast of Phoenicia in cities such as Tyre, Byblos, Sidon, Beyrutus, and Arvad. Consequently, Phoenicians became the greatest sea merchants of the ancient world. Their ships scoured the Mediterranean waters. Carthage,Cadiz, and Marseilles were examples of cities colonized by Phoenician seafarers. Within the history of Palestine, Israel and Phoenicia developed a very close bond, with Israel exchanging her agricultural goods for Phoenicia's trading links. Share Your Thoughts on Lebanon and Palestine. Do you live in Lebanon? Have you ever been there? Share with us your insight, thoughts, comments, and questions! Margaret J. Goldstein captures the beauty and diversity of Lebanon in pictures in her visually captivating book Lebanon in Pictures. Goldstein fully explores the history and culture of this ancient land and people. This book is a visually beautiful, and intellectually stimulating, composite of Lebanon! Click on the link below to visit Amazon.com and Lebanon in Pictures!